Wealth can be transferred on death in a number of different ways, most commonly by will. Yet a person can also use a variety of other means to benefit someone on death. Examples include donationes mortis causa, joint tenancies, trusts, life-insurance contracts and nominations in pension and retirement plans. In the US, these modes of transfer are grouped under the category of 'will-substitutes' and are generally treated as testamentary dispositions. Much has been written about the effect of the use of will-substitutes in the US, but little is generally known about developments in other jurisdictions. For the first time, this collection of contributions looks at will-substitutes from a comparative perspective. 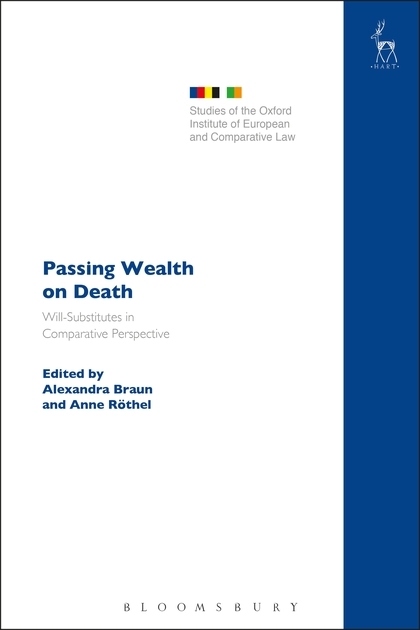 It examines mechanisms that pass wealth on death across a number of common law, civil law and mixed legal jurisdictions, and explores the rationale behind their use. It analyses them from different viewpoints, including those of owners of businesses, investors, as well as creditors, family members and dependants. 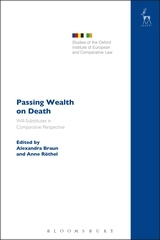 The aims of the volume are to show the complexity and dynamics of wealth transfers on death across jurisdictions, to identify patterns between jurisdictions, and to report the attitudes towards the different modes of transfer in light of their utility and the potential frictions they give rise to with policies and principles underpinning current laws. Anne Röthel is Professor of Law, Chair of Civil Law, European and International Private Law at the Bucerius Law School in Hamburg.